RetSoft is not only for scanning, you can also import or save digital files to you digital archive. We have several easy way to do this. After you start RetSoft you can use the import button on the toolbar to navigate to and select one or more files to be imported into the selected folder in RetSoft. You can only import files, not entire folders! If you want to import entire folders and the files contained in the folders, please use the “Folder Reader” method. After clicking on open you get the option to add metadata to the files. 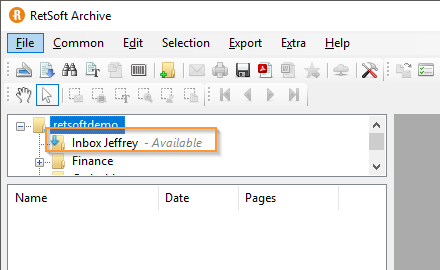 This is an optional step, but recommended when you want to find the documents on values that are not contained inside the documents. 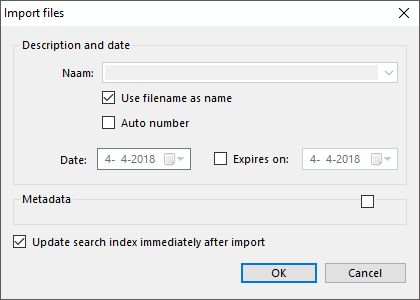 The checkbox “Update search index immediately after import” makes sure the contents of the files is added to the search database so you can search for the files based on words inside the files. Click on OK to start the import. When importing the files RetSoft will check and optimize them for viewing inside RetSoft, so this may take some time when importing large amount of files. The files have been imported into RetSoft, the date was changed to the import date, this is optional. This is the easiest way to add files from you drives to RetSoft. Open Windows Explorer and navigate to the files you want to import. 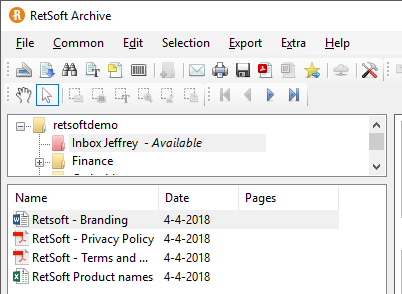 When you have found them, select them and then drag them (while holding down you mouse button) into the folder you want in RetSoft. It is that easy! After dropping the files in RetSoft you get the same dialogs to add metadata like when you import files via the Import Button. Every user can link one folder on their (network) drive to a folder inside RetSoft. If a user places documents inside of that Windows Folder RetSoft will notify the user that new files can be imported. 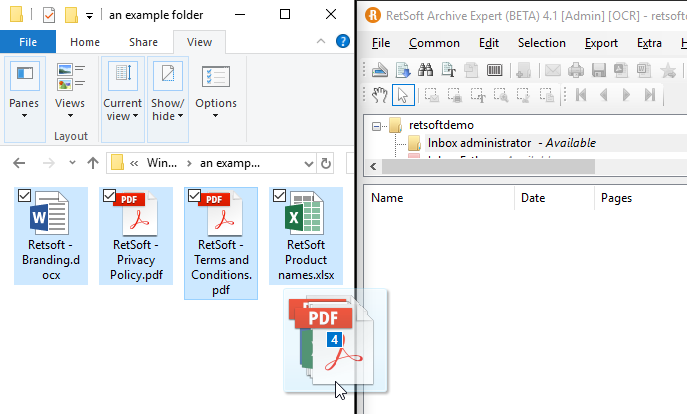 This is an easy way to save files into RetSoft, because after the import the files will be deleted from the Windows Folder and only exist within RetSoft, this way you won’t have any duplicate files. Go to “Settings”, the following dialog will open. On the first tab every user can configure their own inbox folder. 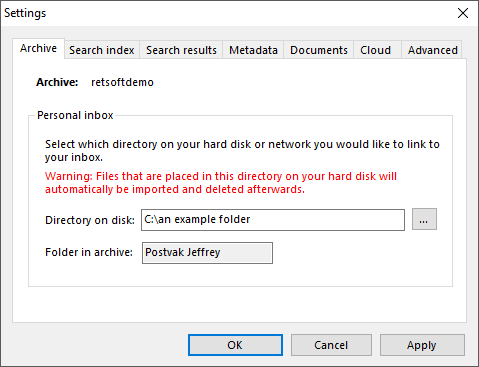 In the example the inbox folder has been set to “C:\an example folder”, the folder may also be located on a network drive. 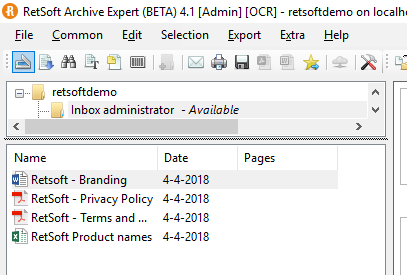 When a file is placed inside the folder “c:\an example folder” RetSoft will detect this and a blue arrow will start flashing on the inbox folder in Retsoft. When you then click on the folder RetSoft will ask to import the files inside the Windows Folder. When you choose yes the files will be imported and the Windows Folder will be emptied.